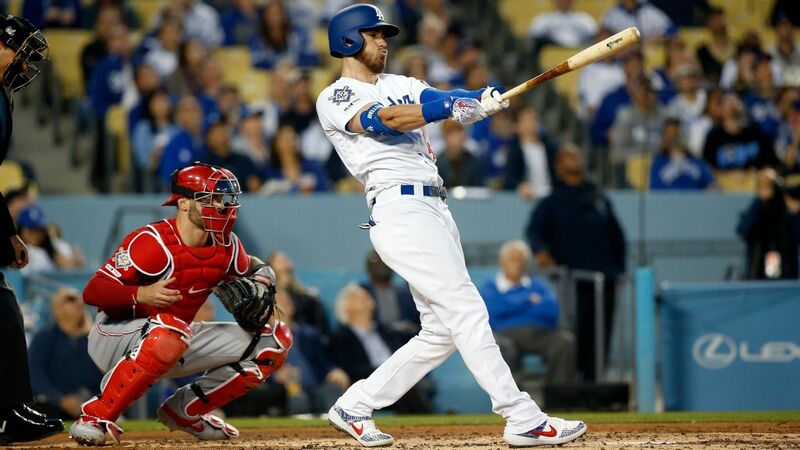 LOS ANGELES -- On a night that ended with a walk-off home run from Joc Pederson and featured an impressive return from Clayton Kershaw, the Los Angeles Dodgers received their best news off the field, where X-rays onCody Bellinger's right knee came back negative. Bellinger, baseball's hottest hitter through the early part of this season, avoided a scare when a 96 mph fastball from Cincinnati Reds starter Luis Castillo hit him close to the kneecap in the bottom of the third. Bellinger, who has a .433/.513/.925 slash line through his first 18 games, settled into a crouch to help ease the pain, then limped slowly to first base, jogged lightly up the foul line and remained in the game until Alex Verdugo replaced him in right field for the next half-inning. The reaction on the field after Martinez's pitch made contact with Bellinger's knee was palpable. Reds outfielderYasiel Puig, Bellinger's former teammate the previous two years, rested both hands on his head in disbelief as Dodgers manager Dave Roberts ran out of the dugout to check on Bellinger. Bellinger said he felt relief when he was able to touch the knee without pain. As soon as he began to walk on it, Bellinger said he figured he would be OK.
Roberts said he expects the typical soreness and stiffness on Tuesday, but it doesn't appear Bellinger will miss an extended period of time. Kershaw said he was "frustrated" when he saw the incident. "You can't miss by that much," Kershaw said. "He's a very good pitcher, has tremendous stuff and has dominated basically in three starts. Obviously, a little wild tonight, but you can't miss by that much. That was really bad." Kershaw, on the other hand, didn't miss much. He gave up a first-inning, two-run homer to Puig -- "I wish I could've done anything but give up a homer to Puig on the first at-bat," Kershaw said -- but nothing else through seven innings. Kershaw averaged only 90 mph on his fastball in his 2019 debut and, according to a scout, didn't throw his slider with enough depth to keep it from resembling a cutter for most of the night. But he had a sharp curveball, a pitch he threw 21 percent of the time. "It was fun," said Kershaw, who allowed just five hits, struck out six and did not issue a walk. 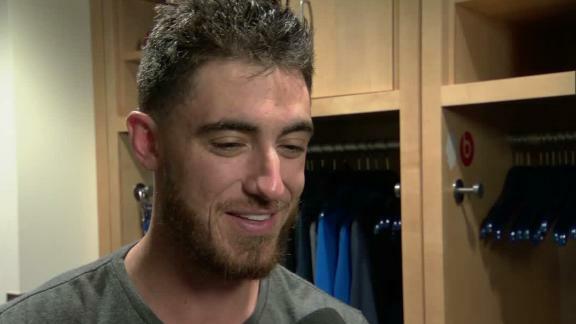 "It's just fun to be back, fun to be pitching in games that matter." Kershaw required only 84 pitches to record 21 outs. From the weight room, he watched another former teammate, Matt Kemp, give the Reds a one-run lead with a two-out RBI single off Kenley Jansen in the top of the ninth, before Pederson delivered the victory with a booming, two-run homer in the bottom half. Kershaw went into the offseason determined to add more velocity to his fastball and more depth to his slider, then felt dispirited when shoulder issues began to plague him early in spring training. He built himself back up again, progressing through a couple of minor league rehab outings before getting activated off the injured list for Monday's series opener against the Reds. He went into that start with some uncertainty about how his stuff would play in a setting like this. "It definitely helps me remember that I can do it -- get guys out, do it efficiently," Kershaw said. "Definitely some things to work on from tonight, which was good; but overall, I think it was a good first step." Cody Bellinger says his knee feels good after getting hit by a pitch vs. the Reds and will assess his injury the following day.